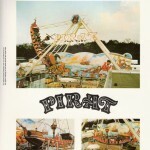 First manufactured by HUSS in 1978, the Pirate (AKA: Pirate Ship) is the largest trailer version of its type, with a swing height of 20 metres (66ft). 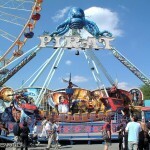 Despite the large space requirements (23m x 13m), the ride can be racked on two 40ft trailers. An amusement park is not complete without a boat swing of some make, and with over 90 built worldwide, chances are it will be a highly reputed HUSS design. The boat is swung with two alternating 105Kw drives that make contact with the underside of the ship, giving riders a sensation of weightlessness with its pendulum motion close to 90°. In 1984 HUSS also manufactured a larger version “Traum Schiff” (Dream Ship) with a massive capacity of 120 persons and a swing height of 33 metres (109ft) This version is rare, with only 2 units ever built. One at Everland, Korea (a double) and the other formerly a travelling unit on 17 trailers, now located in Gorkey Park, Moscow. THIS IS THE BEST DAMN RIDE, IN THE WORLD!!!!!!!!!! 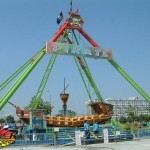 The Pirate sure is a fun ride with kids and adults alike usually laughing their heads off during the ride cycle. While I sometimes wish for it to just go right over the top like the Ranger, I am a fan of the sensation of swinging back and forth and could literally ride this thing all day without getting sick of it. i need to ride this. This ride has opened at Funfields and I was on it only yesterday. Everyone was having a great time. There was a lot of laughing and screaming. Funnfields is in Whittlesea. A great day out. Hi, at Rehoboth Beaches Funland they have this ride called the Sea Dragon. I’m a little jew girl who wants some excitment! 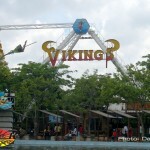 this the best ride ever!!!!!!!!! At mah county fair yesterday i rode this 18 times!! Beat that suckas!! Sea Dragons are pretty popular in Pennsylvania, New York and New Jersey. The amusement parks and piers that have it are Clementon Park,Moreys Piers,Steel Pier, Beech Bend Park and the fun and only Dorney Park. Can somebody tell me if Coney Island had one? Im going to Dorney Park towmorrow. Im gonna ride Sea Dragon 20 times. Dylan sorry but I’m putting an X on your record. 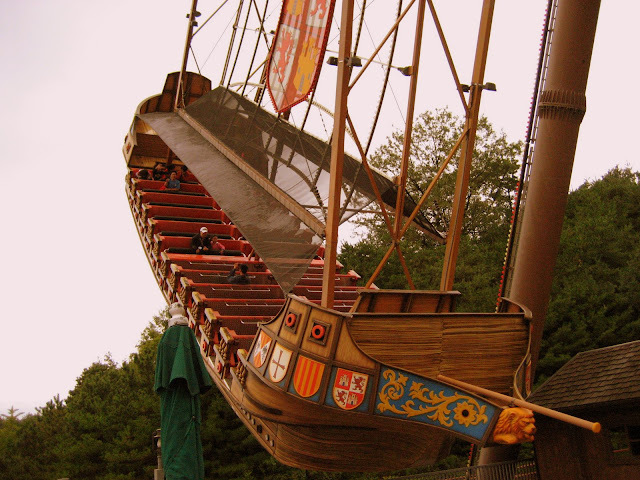 Dylan,your lucky I go to the amusement park often and I love Pirate Ship rides, bucko…. I rode the pirate ship and was singing Coldplay’s speed of sound because the song was playing. If u could see me than you’d understand how fun it was. i rode this when i was little. i remember it so well. it was one of my favorites. 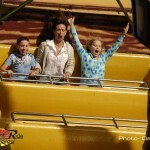 I AM GOING TO HERSHEYPARK THIS WEEK WITH MY FRIEND FROM MY SCHOOL AND I AM GOING TO RIDE IT! CANT WAIT! Rode this as a kid at Long Island’s Adventureland. Delighted to see they still have it. Rode it with the kids just a little over a week ago. Great times. Even better than I remembered. I built it for Ulfric!!!!!!!!!!!!!!!!!!!!!!!!!!!11111!!!!!!!!! DOES ANYONE KNOW WHAT DEGGELLER ATTRACTIONS DID WITHE THIER HUSS PIRATE? Does anyone know where I might obtain a wiring diagram for the pirate? I am a mechanic/electrician for wild waves in Washington state trying to troubleshoot a problem without one and it is a nightmare! Wow, pirate ship ride! I think everyone should be on a pirate ship ride. It is so stimulating!